Bohol is surrounded by a large number of small islands. 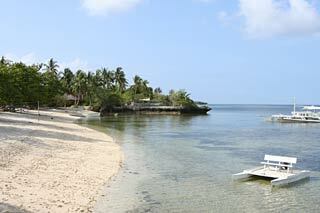 One of them is Cabilao Island, which lies on the West of the main island of Bohol, facing Cebu island. We have had a visit to this triangular shaped 7.2 square kilometer island on our wishlist for several years, but everytime, something or other got in the way, but this time, we finally had the opportunity. To get there (from Tubigon), we took a bus in the direction of Tagbilaran, along the coastal ring-road. We got of at Poblacion Loon, and waited for the jeepney going to the barangay Mocpoc, which is located on the western end of Sandingan island that faces Cabilao. Here is a little pier, where you can find out-rigger boats that can bring you across the canal. The distance to Cabilao is not that far, but since the small resorts on the island are on the opposite side, they will have to bring you around the island. After negotiating a price for the trip, we embarked and set off. The trip on the boat takes about three quarters of an hour, and gives you some nice views of the curious overhanging rock formations that compromise most of Cabilao's coastline. You'll also pass by fishermen who opperate small bankas every once in a while. Some of Bohol's smaller islands, such as Panglao, are connected to the main land by bridges or dams. This way, they are easier to visit, but it also means that motorized traffic can easily reach them and disturb the tranquility. Cabilao is too far from the main island to be connected with a bridge, so the island remains clean and peaceful. The only motorized transport you can find are a few tricycles and a couple of motorcycles, who also serve as so-called 'habal-habal' drivers, that is, they will bring you around for a small fee. However, most of the distances on Cabilao are so small, you can easily walk them. The lack of roads also means that everything on the island has to be brought in by banka: building materials, wood, food (except fish caught locally), and, during periods of draught, fresh water for drinking and bathing. Since the island is not connected to the main grid, electricity is provided from 7.30 AM to 11.30 PM by a generator in Talisay village. The main reason most visitors come to Cabilao is diving on some of the wonderful reefs that surround the island. On the island are three resorts, that mainly cater to divers, who seek out the undisturbed reefs, the peaceful atmospheer, and especially to see Cabilao's famous shoals of hammerhead sharks. Each resort now has its own dive shop, where it rents-out equipment, and can provide pressured air refills for scuba-divers, and even snorkeling out from the beach is much rewarding, although I advise snorkelers to put on a wet-suit as a protection against sun-burn and jellyfish and other stinging creatures that live on or near the reef. 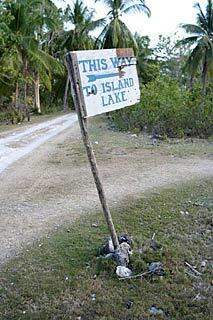 you the way to the island lake. However, also on land, Cabilao has nice things to offer. On the island, hunting of birds is forbidden, and, as a result, you can see more birds here than in most of Bohol. Also, the island is the home to Bohol's only natural lake, lake Lanao, near the barangay Pantudlan, which also serves as a bird-sanctuary. From one of the resorts, it is a nice half-hour stroll to this lake, and, after following a small path through a nipa-covered swamp, you'll reach two observation huts, from which you can observe birds. Be careful going to those huts, as the bridges leading there are not very strong anymore. Cabilao island consists of five barangays (villages), Talisay, Cambaquiz, Looc, Pantudlan, and Cabacongan. The island has a roughly 3,500 inhabitants, who mainly live from fishing and animal husbandry. More than a few of the inhabitants of left the island, and now work in the cities, or abroad, from which they often remit money back home. Just walking on around on this island without much motorized travel is an attraction in itself. It is a good way to get an impression what live must have been in the Philippines a century ago, without the hustle and bustle of modern life. You come across people herding a few goats or a cow; small houses with children playing. The occassional rooster, and so on. But even on Cabilao, the modern times have arrived, as it now too has its own solar powered internet cafe. This internet cafe near the school in the center of the island, is an initiative of the Center for Industrial Technology and Enterprise, Cebu and the German Development Service, and also serves to connect the local people to the internet. Take a bus (either from Tubigon or Tagbilaran) in the direction of Loon. Busses for Loon start in Tagbilaran from the integrated bus terminal in of in Poblacion Loon, and ask for a jeepney going to Mocpoc on Sandingan Island (or just tell the drivers you want to go to Cabilao). In Mocpoc, you can either give a call to the resort you've booked with, and wait for their boat to pick you up, or negotiate a trip with some of the bankas lying there to bring you to your resort. If you are not afraid to use the habal-habal service, or don't have much luggage, you can also join the regular banka that just goes across to Talisay on the opposite coast on the island, and from there ride to your resort. Alternatively, you can reach the resorts directly from Cebu island. Go to the town of Argao, and have one of the resort bankas pick you up from there. The trip across takes about an hour. Note that this trip can only be made at day time, and with good weather conditions. On Cabilao are three small resorts, each offering a similar package of facilities. Probably the best value for money is Polaris Beach and Dive Resort, run by the German-Filipino couple Franz and and Maria Baumann. Franz is one of the few German resort owners who speaks fluent Cebuano, and is also active to build up the local community and preserve the islands natural beauty. They offer nice air-conditioned rooms with hot shower at about USD 32 per night. Considering that everything has to be brought from the mainland by boat, this is a fair deal. On their resort, that lies directly near the beach, they have a nice swimming-pool and restaurant. The oldest resort on Cabilao is La Estrella Beach Resort, located directly at the sea, has a number of neat luxery bungalows in native style, a restaurant and a bar. This place, too is run by a German-Filipino couple. The smaller bungalows are 10.40 euros (PHP 600) and 13.50 euros (PHP 800) per night, and can house two persons; the larger bungalows are 20 euros (PHP 1200) per night, but can house four guests. If you come here for diving, they have some interesting package deals, such as 1 week stay and 12 dives for 389 euros (PHP 24,500). Both these resorts are close to each other on a strip of beach on the western tip of the island, near Baluarte Point, and face Cebu. A little to the north of La Estralla, you can find the remains of an old resort, an old dipilated lighthouse, and new automatic light beacon. Here you can also find the Sea Explorers dive school, which has its own compressor, boats, and equipment to offer diving trips and (PADI) dive courses. The third resort on Cabilao is Cabilao Beach Club on the North-Eastern side of the island, close to the barangay Cambaquiz. Run under German-Swiss management. This resort, in operation since January 2004 and has four bungalows with all facilities, and a restaurant plus bar. You may wish to make reservations in advance with one of the resorts, so they know of your arrival, and can pick you up. If you're interested in diving, it is best to ask for one of the combined all-in arrangements, which can save you a lot of money. 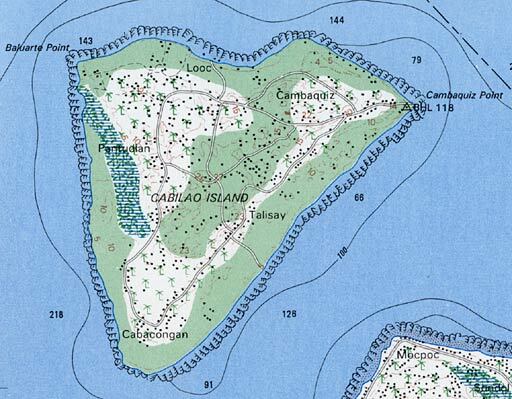 Map of Cabilao Island (Taken from NAMRIA map of Loon).